This dish brings dear memories from the time I lived in Greece. It was a dish I got to know at a friend’s house too many years ago. Probably one of the first dinners I had as a “grown-up”. It’s very easy and quick to make. I got my refresher course on this recipe with Emeril Lagrasse on the food network. Gotta warn you, it’s peppery. How to make: Mix the flour with the salt and pepper. Flour the veal scallops, lightly. Heat 1 1/2 tablespoon butter in a heavy skillet. Saute the veal, one minute per side. Deglaze the pan with the wine. Now is the time to use a wooden spoon to scrape all meat bits from the bottom of the skillet and get a great flavored graving and a pan easy to clean later. 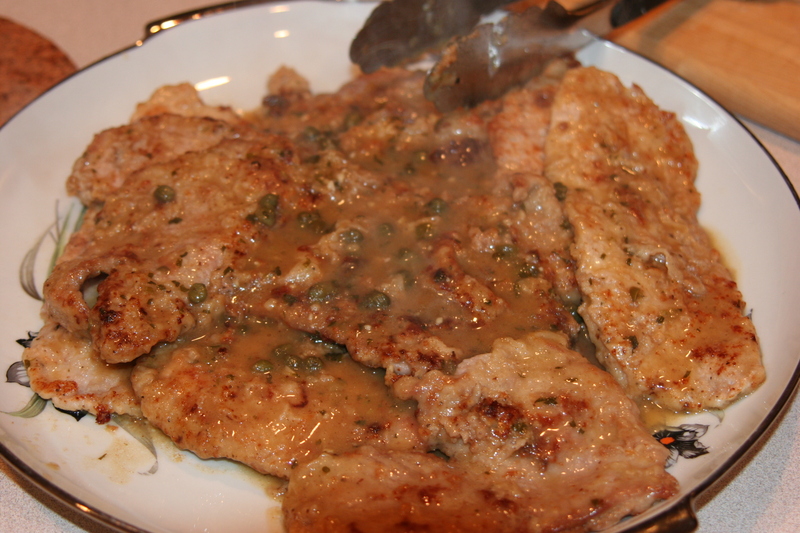 In a few minutes, add the chicken stock, garlic, lemon juice from a lemon and capers and cook for another five minutes. Add salt to taste, if needed, and the remaining 3 1/2 tablespoons butter. When the sauce is lightly thickened, add the chopped parsley, cook for couple more minutes and enjoy!